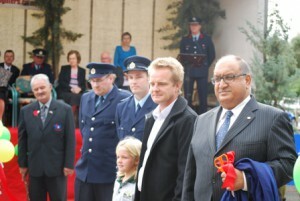 Saturday’s impromptu royal visit to Tamahere has sparked wide public interest, opportunism and prompted media reports. In the Herald on Sunday, Tamahere became a “tiny Waikato town” that had been through some tough times in recent years. Who knew? One woman, children’s book author Sharon Holt, who managed to get her latest book in Prince William’s hand, hopes to capitalise on the royal connection. The word about the Tamahere School staffs’ recent environmentally focussed working bee at the Tamahere Reserve has spread. Teachers dig in, was the headling in today’s Cambridge Edition and featured school principal Waveney Parker and Tamahere-Mangaone Restoration Trust member Leo Koppens showing off the colourful, new signs some of the teachers created for the reserve. The working bee was described as a change from the usual “self-indulgent fun” the teachers usually observed on the teacher-only days before the start of each new school year.